You Are Here: Home > Why Buy at Bridgewater Nissan? When you shop Bridgewater Nissan you should know only the best work here and only the best are sold here. 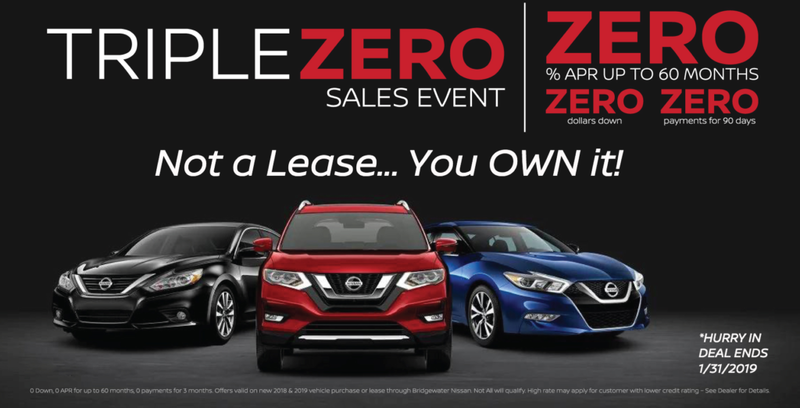 ZERO percent APR up to 60 months, ZERO down, and ZERO payments for days on New Vehicle purchases. And feel confident knowing that our pre-owned vehicles have been through a rigorous inspection. Inside and out, on the road and under the hood, we put each vehicle to the test before we list them for sale. Worry free and stress free driving starts here. At Bridgewater Nissan we’ll do more than give you a great deal on your vehicle. We offer an array of services that help you keep your vehicle at its best for as long as you own it. Our goal is complete customer satisfaction!